A little sparkle can go a long... but sometimes it's fun to go head to toe glitter! 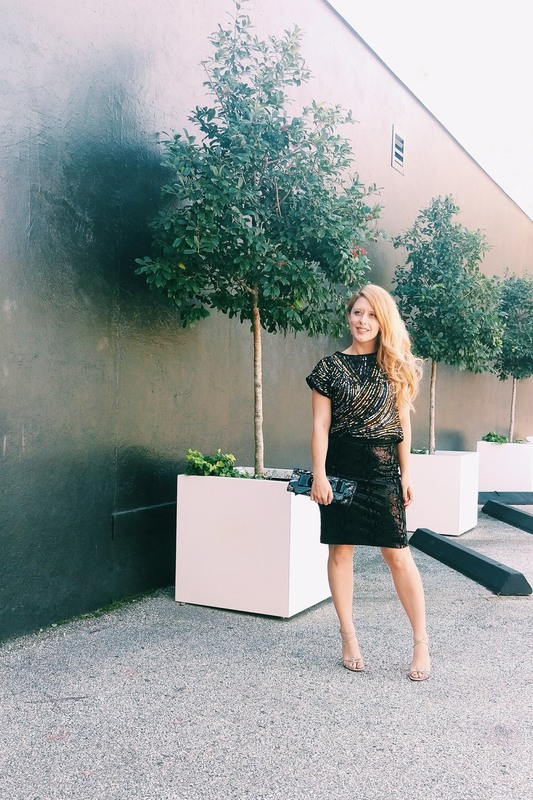 For today's Fast Forward Friday look I thought it would be fun to share a party look for the holidays! I wore this top a few times previous here and here. I do not reserve sequins for only special occasions. I think it's perfectly appropriate to wear sequins day, night, office, casual... it all depends on how you put the look together. 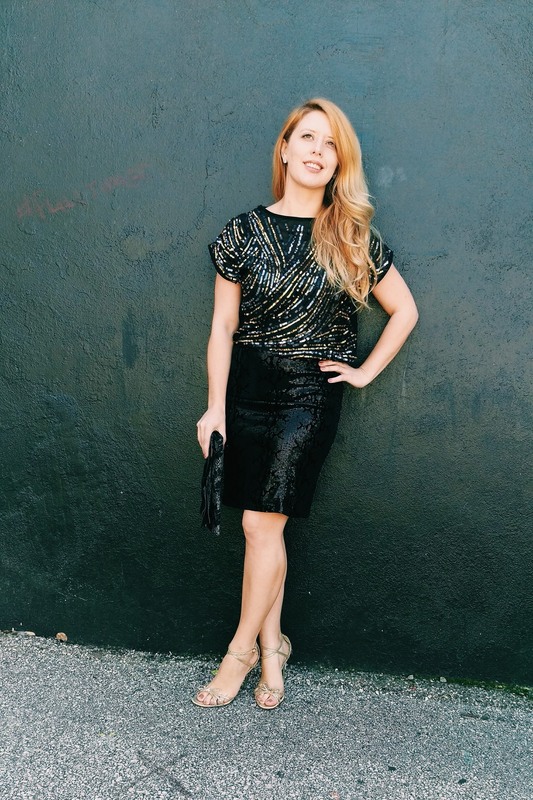 Today I layered a multi-colored sequin top over a sequin pencil skirt. Karen Kane makes some of my favorite wardrobe staples. Her products have a laid back sort of California vibe, but are truly classic pieces. I've worn this skirt more times than I can even count. I found a few other ones here, here and here. I also want to point out that you can mix your metal - don't be afraid to wear gold, copper and silver. The top kind of ties all of the metallic together but I decided a pair of pale gold strappy sandals with a silver/black lace clutch. I think it would be really easy to make a DIY version of this clutch by adding a cute bow to an already assembled lace purse. If you missed the post earlier this week on The Biscuit Paint Wall, this was actually taken on the wall next to it. Being a lifestyle blogger has kind of pushed me to constantly look at my surroundings. I'm always on the hunt for cute cafes, new restaurants and of course - fun walls. It's funny, because the Biscuit Paint Wall is so colorful and the wall directly next to it is so modern. It's such an interesting juxtaposition. In the last post where I wore this top, I paired it with a full, eyelet lace skirt. I wore a work appropriate bag and pair of pumps since it was worn for client meetings for a day at the office. Although the color schemes are similar - the top takes on such a different feel with the sleek pencil skirt. I would probably wear this outfit for a dinner out, holiday party (work or fun) or even a night at the ballet. Have you heard of the VSCO cam/app? I'm so infatuated with it! I recently discovered it when I read an article from when Nylon interviewed Jenny from Margo & Me. 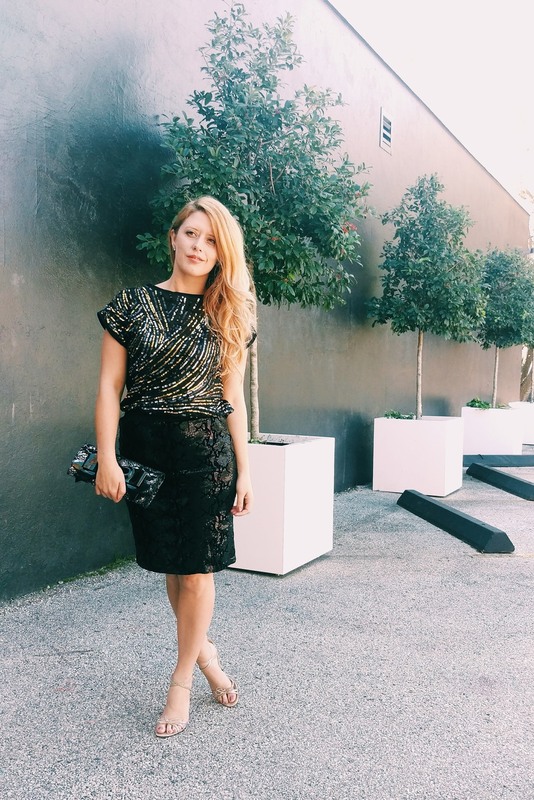 Jenny has the best sense of editorial style and her blog is a daily read for me! She mentioned the VSCO app in her interview and I downloaded it. It's funny though - I didn't actually start using the app for a few months. I started doing some more research on it (education helps with new software) and I'm in love! It has the best filters, features and takes amazing pictures. It's available for Android or iOS - if you haven't checked it out, I highly recommend.